Meanwhile, in medium bowl, combine salmon, 1/2 cup corn flake crumbs, mayonnaise, mustard and egg; mix well. Shape mixture into 5 patties, about 3 to 4 inches in diameter. Place 1/3 cup corn flake crumbs in 9-inch pie pan. Coat each patty evenly with crumbs, pressing lightly to coat both sides. Heat oil in large nonstick skillet over medium heat until hot. Add patties; cook 9 to 12 minutes or until patties are hot and firm to the touch, turning once. In small bowl, combine all dill sauce ingredients; mix well. Split warm biscuits. 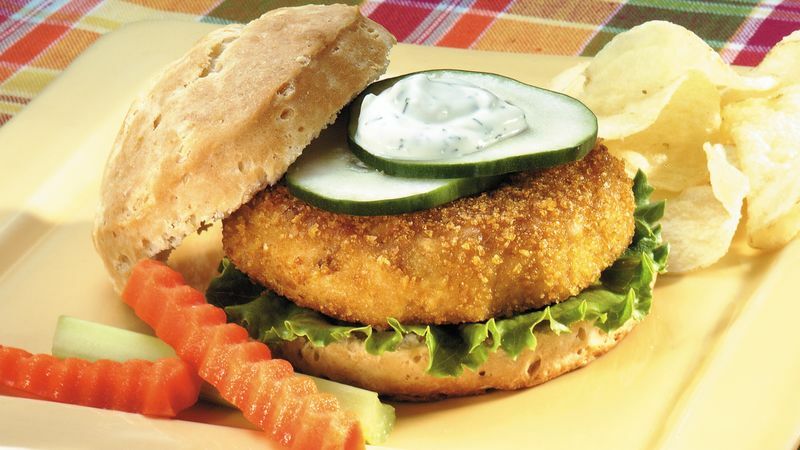 Top bottom halves with lettuce, salmon patties, cucumber slices and dill sauce. Cover with top halves of biscuits. Serve with any remaining dill sauce.